The advancement in Technology has given new dimensions to all the fields and industries. Some of the most significant changes can be observed in the field of photography and videos. Firstly, we saw the development of digital cameras. Then our smartphones got enabled with good quality cameras, eventually replacing digital cameras to a large extent. Then we saw the innovations in the digital camera accessories market. Those innovations were not just limited to them and even covered are mobile phones accessories market. And now we have the 360-degree Selfie Cameras. The most amazing innovation and a true outcome of this great journey of developments in the Photography Field. Here, in this blog we will be talking about some of the best 360-Degree Selfie Cameras available in the market. But before that first have a look at the features we should consider while picking up the 360-degree selfie camera. Videos captured with the presently available 360-degree cameras have 4K resolution which is 4 times the resolution of 1080p videos. 360-degree video with 4K resolution is a massive advancement in the camera industry. Many 360-degree cameras offer photo domes, which has a dead spot at the bottom of the camera. But now there are many excellent cameras available in the market now with no such dead spot and create 360 x 360-degree spheres. Many 360 Degree Cameras give best results only with some specific OS or even with specific phones. Hence, it is necessary to check the compatibility of the 360-degree camera with your smartphones and the OS. This is a must feature to check for if you are buying the camera for your adventure trips and recording the movements in the sports. This highly innovative spherical camera by GoPro is the game changer for all the 360-degree camera market. It can capture a 360 Degree video of 5.2K resolution at 30fps or a 3K resolution video at 60fps. The camera is specifically designed to keep the sensors close together. The exterior of the camera has a rubberized texture which gives a better grip while taking pictures and recording videos. A strange feature of it is it needs 2 SD cards one records the images and videos from the front lens and the other from the back lens. The camera has been designed to provide to record immersive 360-degree video and audio. It has two 12MP sensors and a twin lens optical system that enables it to capture 2 wide angle images and automatically merges them into one complete spherical image. It captures 360-degree video with a 4K resolution. There is an in-built 4-channel microphone to capture high-quality audio from all four directions. It is embedded with a high-speed wireless radio for faster data transfer. The 360 Camera version launched this year by Samsung is the taller, slimmer version of Gear 360 (2016). The design of the camera is very handy and videos and photos captured by it has better quality than the predecessor and has improved the little problems present in the first version. The camera has big button which lets you capture pictures and start and stop recording videos. There is a small button which helps in navigating the menu and lets you connect he camera with the phone. All the menu information is displayed on a tiny screen below the record button. Kodak created the camera with the aim that even a 235-degree is very good angle and enough to capture immersive picture and videos and 360-degree is not always needed. This camera by Kodak is shockproof, freeze-proof, dust-proof and splash resistant. With this it also has Wi-Fi and NFC connectivity feature and comes packed with a bundle of mounting accessories, hence that explains the price of it. The Kodak PixPro SP360 4K is designed in the shape of box with sharp edges and corners and is made up of plastic. The lens of the camera sits at the top of the box and gives us the horizontal 360-degree footage. One side of the box has the control for the shutter, the other side has the control for the settings adjustments, the third side has the small LCD display for accessing the system menu and the fourth side comprises of micro USB, Micro HDMI ports and Micro SD card slot. Insta360 has launched a number 360 camera but the latest model the Insta360 ONE has been dubbed has “Shoot First, Point Later” camera because of the “Free Capture” Technology used in it. This camera gives everything that a consumer would want from a 360-Degree camera 4K Video, 24MP photos, live streaming. It is compatible with both the iPhone and Android Smartphones. It lets you shoot RAW photos so that professionals can do the editing of the video as per their liking in professional editor tools. You can also capture 360-degree video in slow motion. The Smart Track feature lets you select the main object of the video and the camera shoots a 360 video with the object in the center frame always. The company is known for sat navs and sports watches and with this camera it is entering into the 360-camera market. The most unique feature of VIRB 360 is that the captured photos and videos have a 5.7K resolution. It even has a free VIRB Edit Software for its consumers for them to stitch the footage captured from it. Garmin has embedded the camera with four microphones to produce the wraparound sound. The features which give it a notable Garmin feel are waterproofing, GPS, a gyroscope and an accelerometer. This camera is best fit for all your adventure sports as it is waterproof to 33 feet. It’s the first and only 360-camera with USB C type connecting port. That means you can plug it directly into your phone, flip the phone and start shooting. Without giving any thoughts about battery life and transferring files. With the affordable price, it is among the least expensive 360-degree camera which makes it easy for lot many people to experience the 360-degree photography. The above list not includes all the cameras that we have in the market. We discussed only the ones that were liked by us. 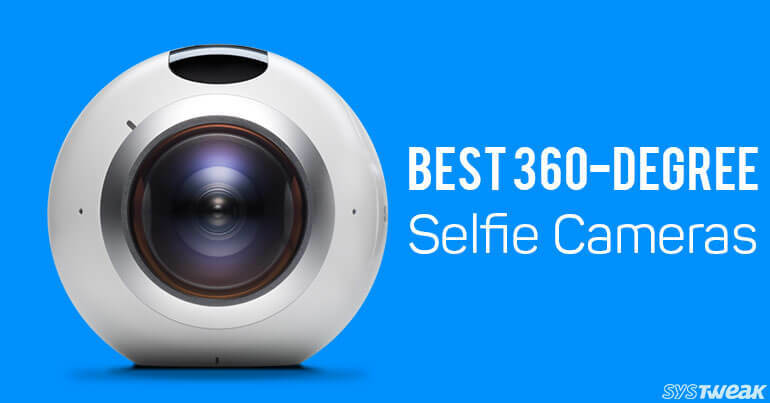 Please tell us about your favorite 360-degree selfie camera that we have not included in the list through comments below. Subscribe to our newsletter to receive more such blogs directly in your inbox. "These Are The Best Apps For 2017", Says Apple!